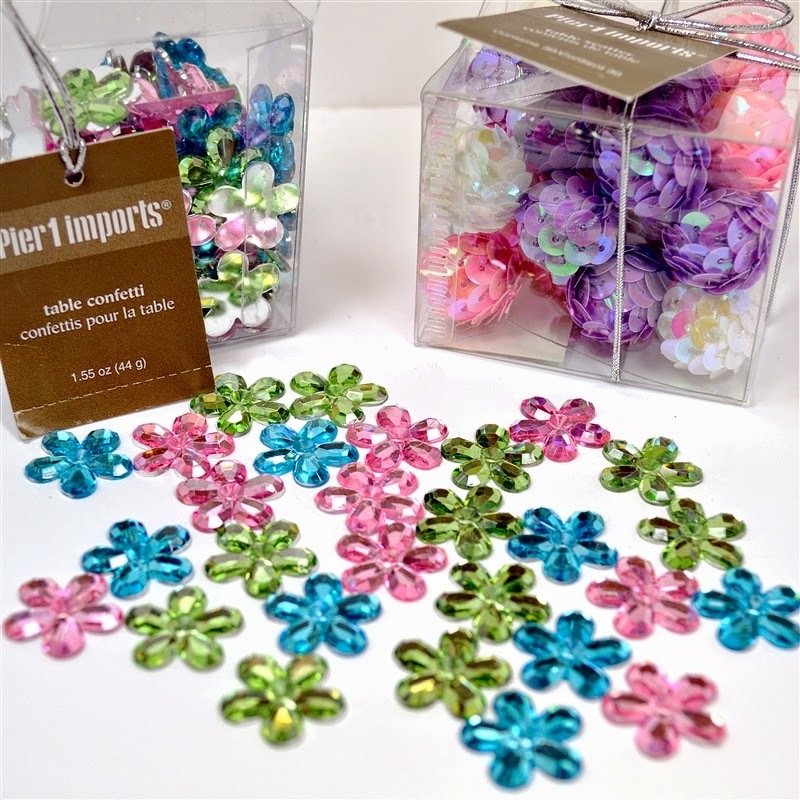 Sometimes you can find embellishments for your crafting projects in stores that are not generally thought of as "craft stores." I happened to stop in a Pier 1 Imports recently and found some great gem flowers. 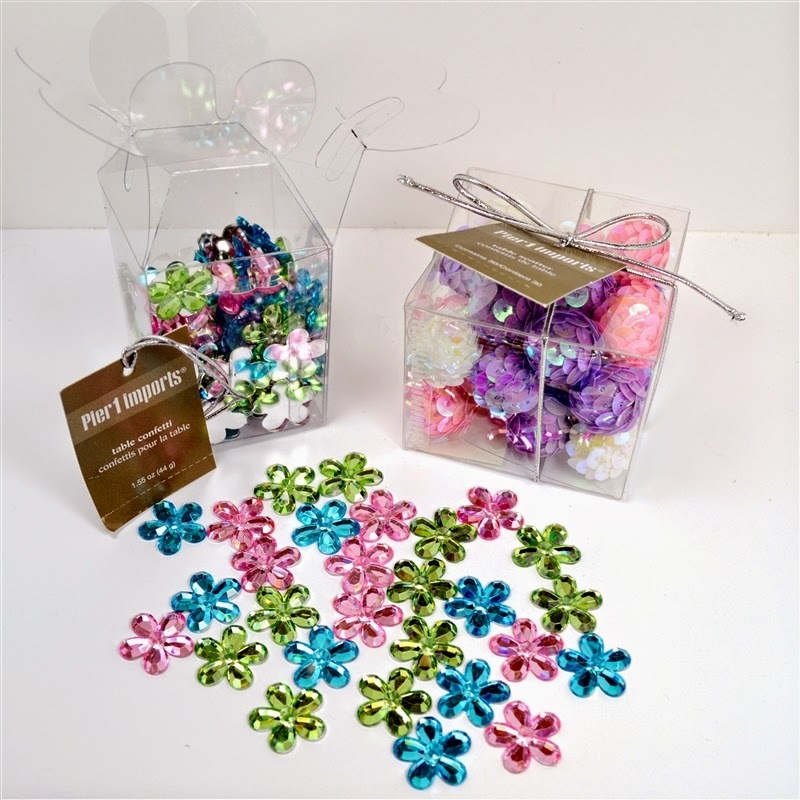 They are very similar to the flowers I used to get from Creative Charms. These little flowers are sold as "table scatter" for parties. I thought the bright spring colors were very pretty. 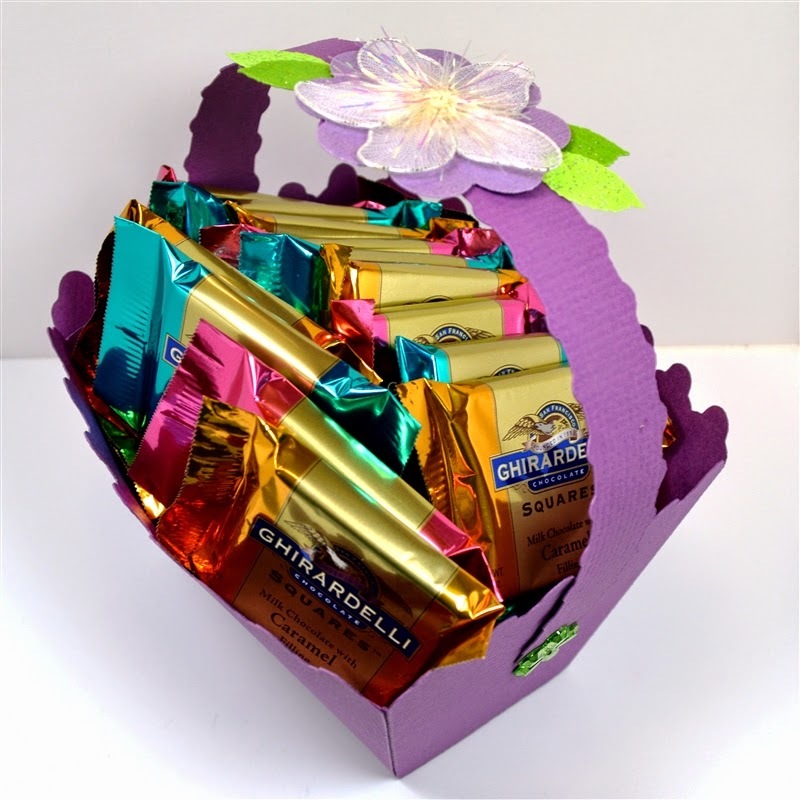 The box holds about 150 of the flowers and it was $4.50 and then 20% off. This was before Easter - if you find these in the store now they might be further reduced. 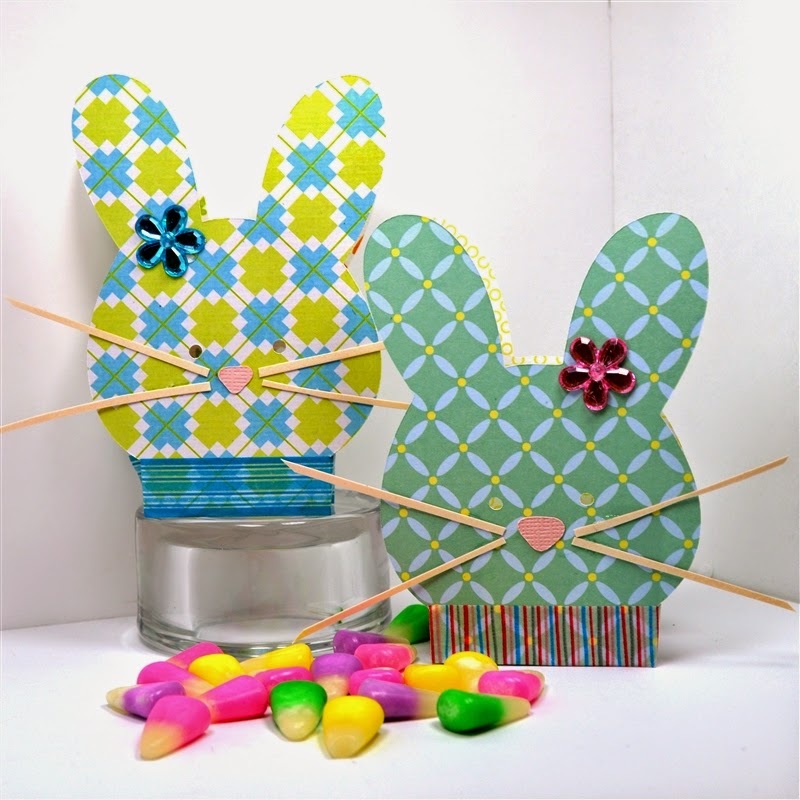 I've already used some flowers to decorate the bunny candy holders. ... and the outside. This helps to keep the handle anchored and also adds a bit of decoration. 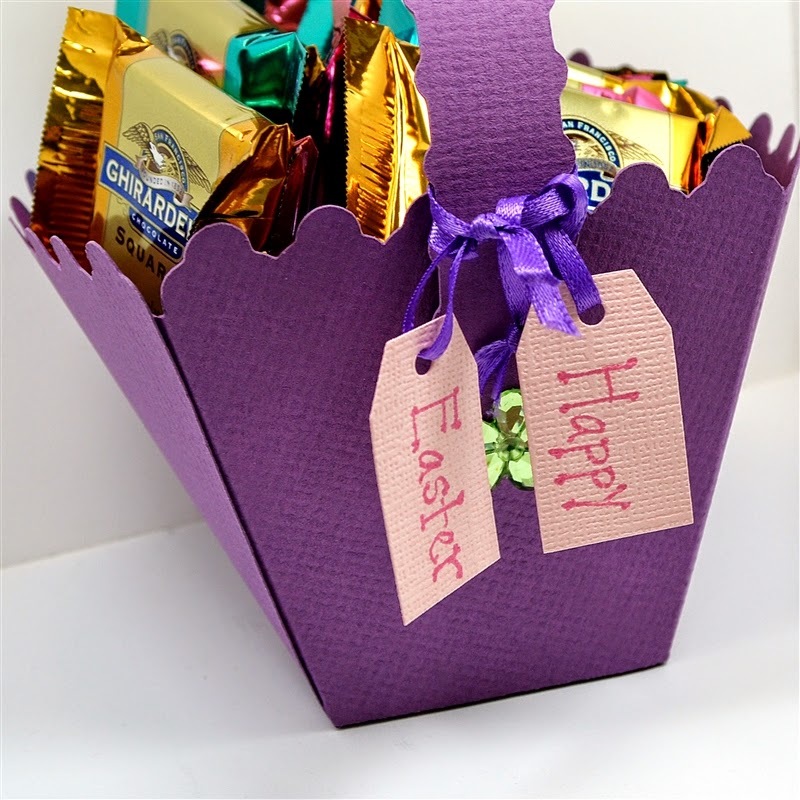 The basket is from the Easter Seasonal Cricut cartridge. The design actually has small circle cut outs in the top scallops. 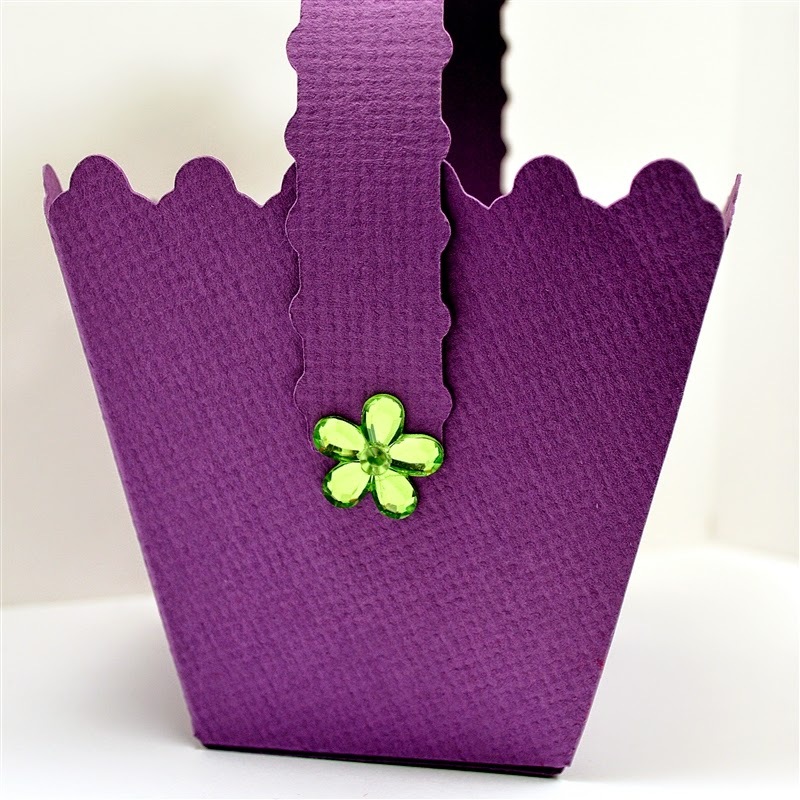 This photo shows one of the baskets with the original design - I used "hide contour" to eliminate the holes when I made kits for a class in the heavier purple cardstock. I need to try cutting this basket with the Explore to see if the circles will cut more neatly and will be centered on each scallop. 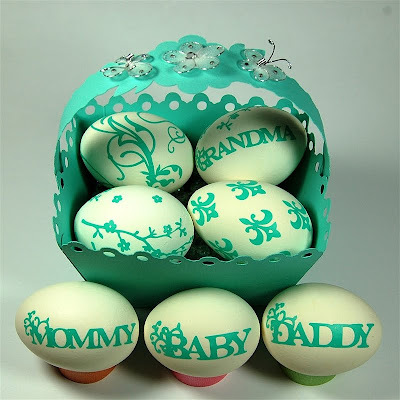 The Easter Seasonal Cricut cartridge is also part of the Image Library Subscription (it is called Easter 2010 on the list). In addition to the gem flowers, I bought a box of 30 iridescent white, pink and purple sequin balls for $4.95. These are also called "table scatter" but I have another idea for them. Can you guess what it is? 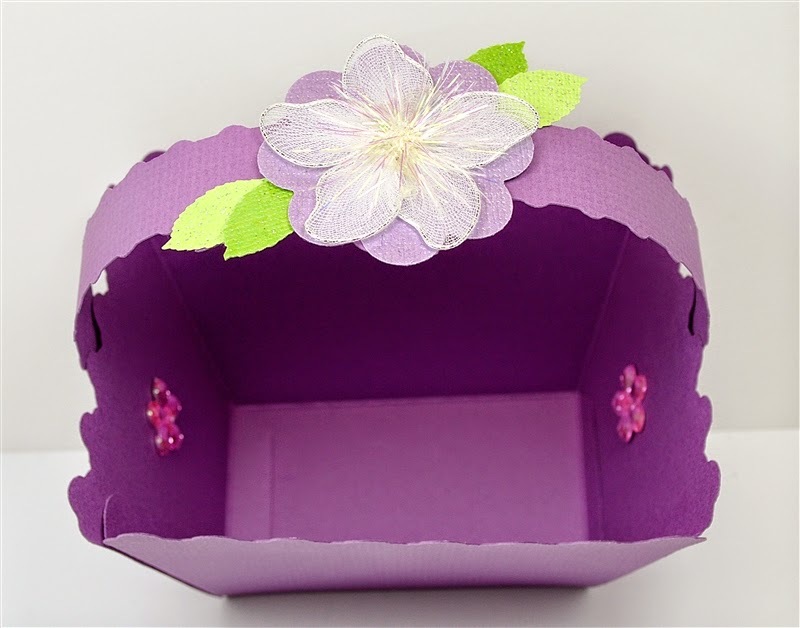 Are there any "non-craft store" places where you have found interesting embellishments for your projects? I'd love to hear about them and I am sure other readers would too. Just leave a comment to share your "finds" with everyone! I seem to be coming down with a bit of a cold - just as the weather is getting better. I suppose it could be allergies, they say this is a bad year for them. Hello. I'm still not receiving your posts in my email. I went directly to your website today. Thanks for the tips on the flowers. I'm hoping you can figure out why I don't receive your emails anymore. I look forward to seeing them daily. I'm gonna have to swing by Pier1 tonight. Love those flowers! One of my fav "Non Craft" stores to shop for scrappy stuff, is Tuesday Mornings. Depending on when you go you can find some incredible stuff from major brands like American Crafts. I even found a 30-pack of Alcohol markers (Copic like) for $20. The hardware store (like Home Depot or Lowes) has many possibilities--screening in different size grids, metal flashing, many kinds of string, nuts, gears, and of course paint chips to name just a few.